J-370 - Non-tremolo 12 string bridge with 12 fully adjastable saddles. J-380 - Flat mount non-tremolo string thru body featuring 6 fully adjastable bridge saddles. J-390 W/Trailpiece - Tune-o-matic 2 point adjustable non trem with Charvel floating tailpiece. JT-6 - Tremolo commonly used on the Jackson USA and Japanese Charvel till 1989. JT-380 - Die cast fulcrum tremolo with adjastable tension arm. JT-390 - Tune-o-matic bridge widely used on Japan guitars. JT-470 - 2 point vintage style tremolo. JT-480 Fulcrum - Vintage style synchronized tremolo. JT-490 W/Roller Nut (Made by Gotoh, Japan) - Hi mass fulcrum tremolo with lock down saddles featuring roller nut for greater tuning stability. JT-500 - Affordable double-locking tremolo for Performer and another low-price series. JT-580 (Made by Takeuchi, Japan) - Floyd Rose licensed double locking tremolo with machined steel baseplate. JT-580LP (Made by Takeuchi, Japan) - Same specifications as JT-580 tremolo but with low profile fine tuners. JT-585LP (Made in Korea) - New JT-580-based low-price Jackson double-locking tremolo. This tremolo is widely used on JS guitar series. JT-590 (Made by Schaller, Germany) - Floyd Rose licensed tremolo precision crafted in Germany. All parts interchangeable with Floyd Rose Original bridges. JT-770LP - 7-String version of JT-580LP tremolo. JT-790 - 7-String version of JT-390 tune-o-matic bridge. JT-790LP - 7-String low profile tune-o-matic bridge. SG23 Fulcrum - Vintage style 2-Point synchronized tremolo bridge for entry-level guitars. 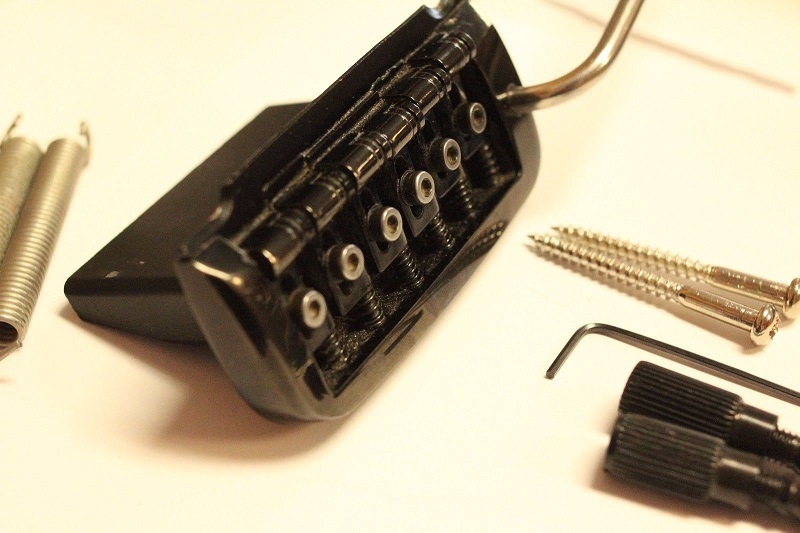 This bridge similar to a Gotoh two point tremolo and its parts are suitable for replacement. Fulcrum - Vintage-style 2-Point synchronized tremolo bridge for entry-level guitars. HT-7 - Direct-mount string-through hard-tail 7-string bridge. HT-8 - Direct-mount string-through hard-tail 8-string bridge. CBT-02 - Grover Jackson 4-string bass guitar bridge. RBB-10 - Adjustable 4-saddle bridge. Similar to JB-340. RBB-15 - Adjustable 5-saddle bridge. Similar to JB-350. RBB-20 - Adjustable 5-saddle bridge. Similar to JB-350. JB-340 - Hi mass fully adjastable for string height and intonation. JB-350 - Hi mass fully adjastable for string height and intonation. 5-string version of JB-340 bridge. JB-440 - Precision cast hi density bass bridge with track mounted saddles. JB-540 - Tune-o-matic type bridge with strings loaded thru body for improved response. JTB-4B - 4-string bass bridge. This tremolo is used on JZB guitar series. Floyd Rose Original - Probably most famous tremolo in the world. High quality, very popular feature on the top guitars. Floyd Rose FRT-O2000 - Floyd Rose Original analog. Good tremolo with high quality parts. Floyd Rose 1000 "PRO" (made in Korea) - Popular mid quality double-locking tremolo. The low-profile version of Floyd Rose Original tremolo. Floyd Rose Special (FRT-S2000) (made in Korea) - Double-Locking Tremolo with cheap zinc alloy metal in place of steel. Floyd Rose Special 7-String (FRTSSS2000) (made in Korea) - 7-String double-locking tremolo with cheap zinc alloy metal in place of steel. Schaller Fine Tuning Tailpiece - Seems like Tune-o-matic bridge but with additional finetuners. Kahler 2440' ("Fixer") - Advanced design features adjustable string spacing, height and intonation. Kahler 2450 - Wide bass fixed bridge. TonePros T3BT-B - The Tune-o-matic TonePros T3BT is a locking Nashville style bridge with “easy to use” features like intonation adjustment on the pickup side, phillips head saddle adjustment screws, and pre-notched saddles, large posts, and metric thread. This model fits most guitars made overseas. TonePros TP7 - Tune-o-matic adjustable bridge. It maintains the same locking and tonal features of TonePros model T3BT. It features metric threads that fit most imported 7-String guitars. This page was last edited on 17 November 2018, at 08:20.